Having trouble viewing this HTML email? Click here to view it through your web browser. The Employment Allowance was first available from 6th April 2014. For Tax Years 2014/15 and 2015/16, If you were eligible, you could reduce your employer Class 1 NICs by up to £2000 each tax year. For the Tax Year 2016/17 the allowance was increased to £3000. It remained at £3000 for Tax Years 2017/18, 2018/19 and remains the same for 2019/20. Within CIA create a new nominal for NIC Employment Allowance. We would suggest this being a P&L nominal but please check with your accountant. After completing the payrolls for the period 6th April – 5th May and having submitted the appropriate FPS's (i.e. weekly, fortnightly, four weekly or monthly), you will need to prepare and submit an Employer Payment Summary (EPS). You will have previously used this if you have claimed CIS deductions suffered or if you have recovered any Statutory Payments. 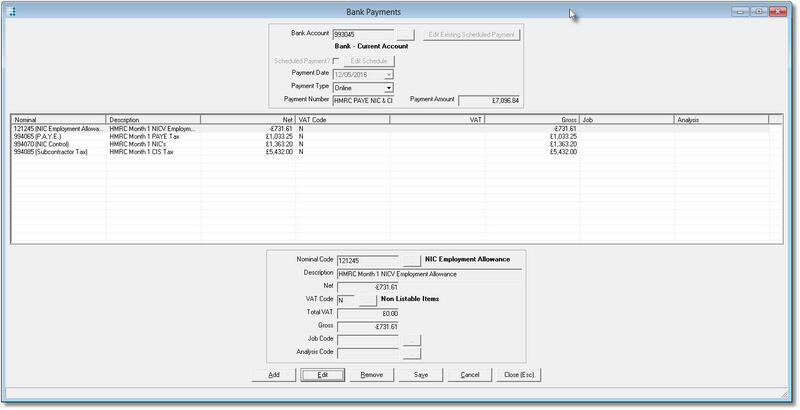 From the Menu, select Online Filing>Real Time Information(RTI)>Prepare Employer Payment Summary. The Month will default to 1 and select [View]. If you are recovering any Statutory Payments or CIS Deductions Suffered, enter the amounts against the appropriate boxes. Account Information is used by HMRC if you are owed any monies for overpayments, you can enter your bank details here or leave blank if not relevant. Enter a tick ( ) in Eligible for Employment Allowance then select [Save] and [Close(Esc)]. Once the Employer Payment Summary has been prepared and submitted for Month 1 showing that you are eligible for Employment Allowance, you do not need to do this again. Only prepare & submit the EPS in following months if you have any statutory payment or CIS Deductions suffered to reclaim. When entering the Bank Payment within CIA, the following is required to ensure your bank nominal updates correctly and that you have a record in the new nominal created for NIC Employment Allowance. It is your responsibility to only claim back up to the £3000 annual limit. You can keep a check on this by looking at the nominal created for NIC Employment Allowance and also within HMRCs Online Service in 'View PAYE Liabilities and Payments' . Once made, HMRC will automatically carry your claim forward each tax year. So at the beginning of each year you should check your circumstances haven't changed.